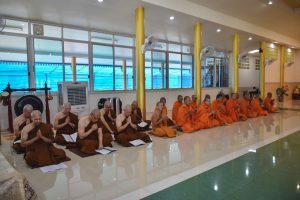 Photo taken at Samathidhammaram Centre before participants leave for ordination. 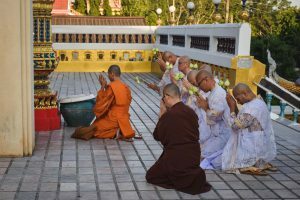 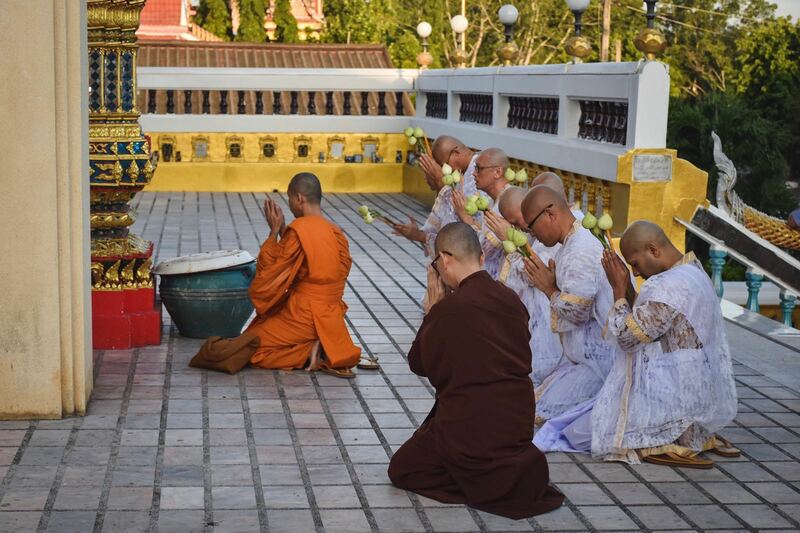 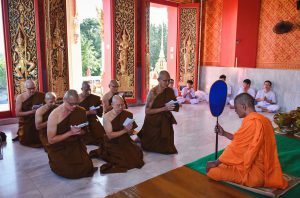 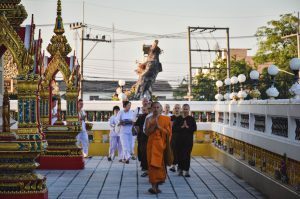 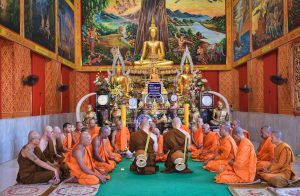 The above are requisites that would be offered to the Preceptor, Acariyas and monks of Wat Khlong Tan where the ordination is to be performed. 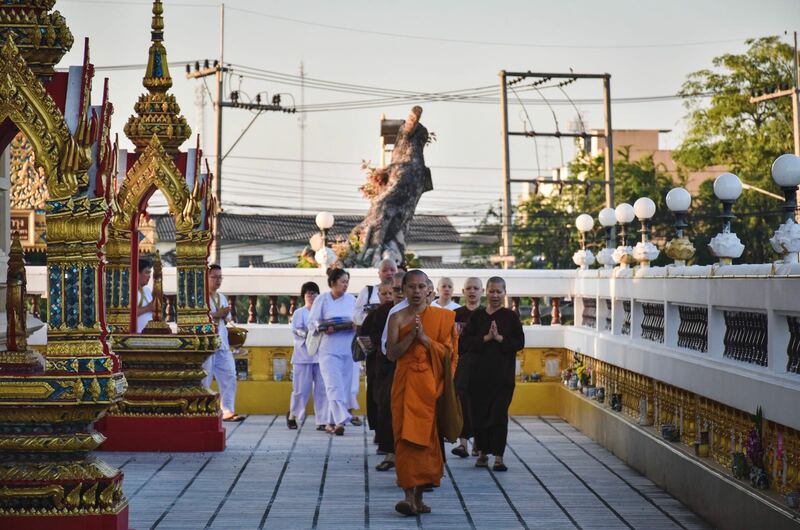 The participants arrived at Wat Khlong Tan. First, the laypersons help to carry the requisites (flowers, almsbowl and robes) that are to be offered to the newly ordained monks. 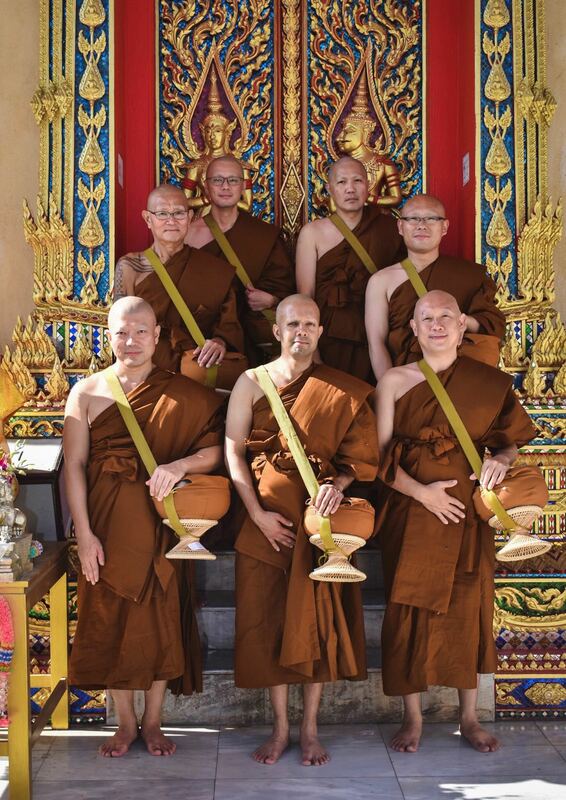 The group, led by Kubah, walked 3 rounds clockwise outside the Ubosot (ordination hall) 3 times chanting Itipiso. 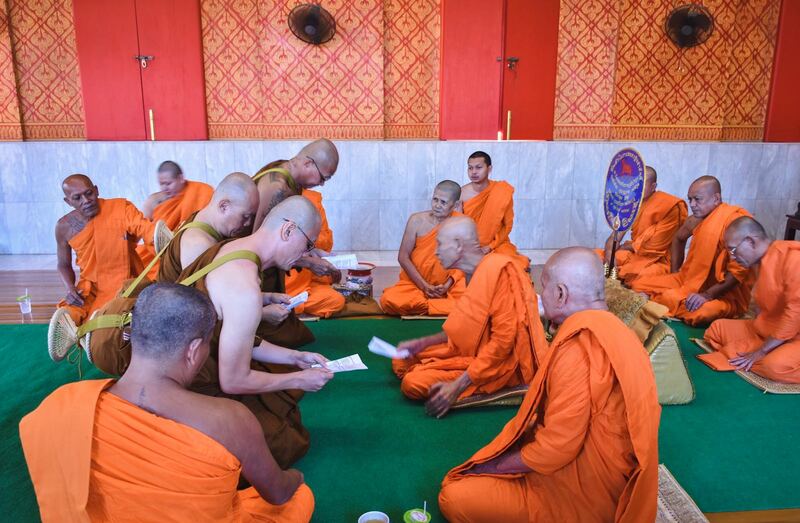 After that, the participants who would be soon ordaining as monks made aspirations outside the Ubosot. 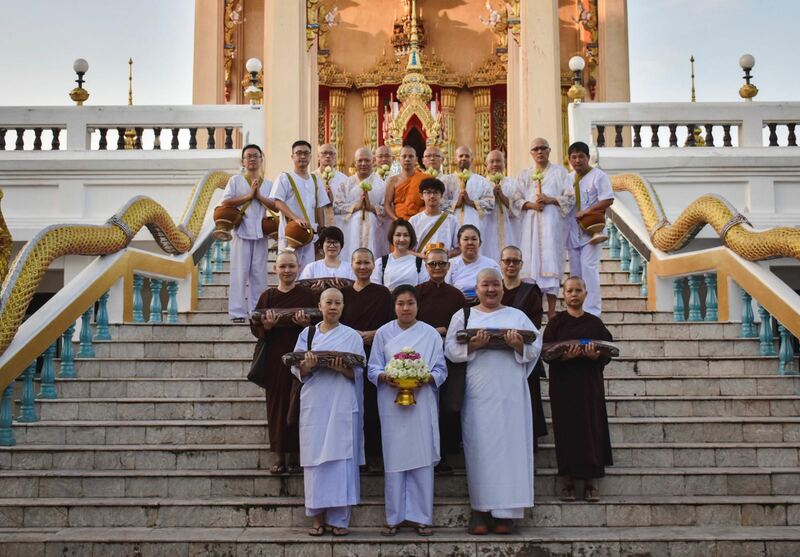 6 Dec 2017- Group photo taken outside the Ubosot (Ordination Hall) of Wat Khlong Tan, Ban Phaeo, Samut Sakhon. 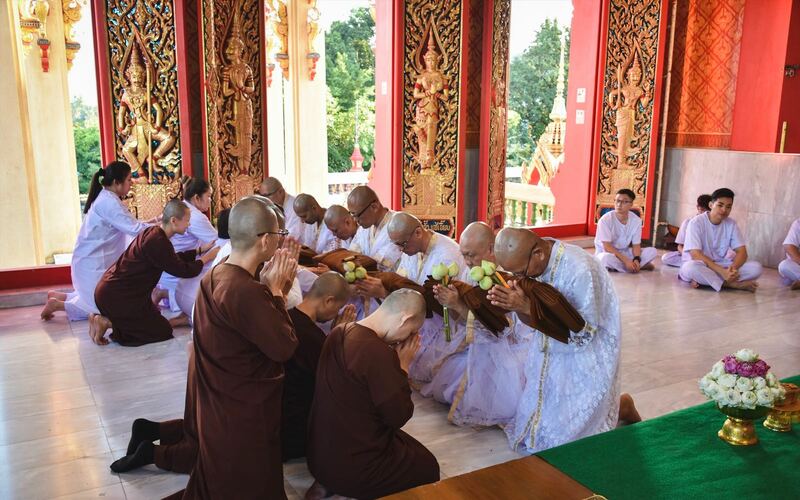 Once everyone entered the Ubosot, the ceremony begin but offering of robes for the participants who wished to ordain as monks. 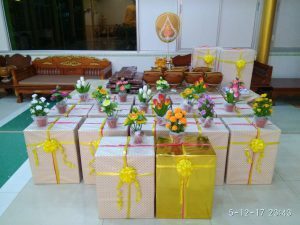 The offering is made by the family member of the participant. 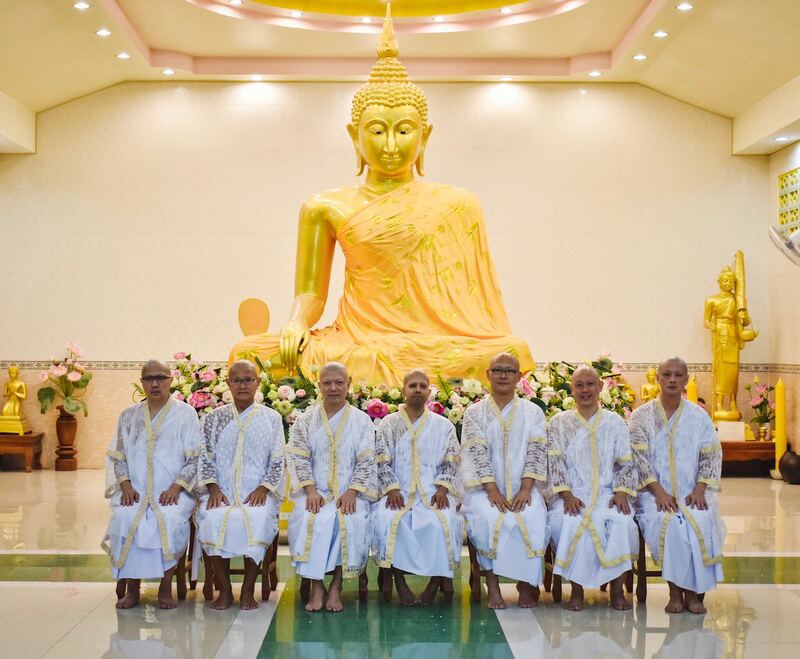 If a family member is not present, then a representative would offer the robes to the participant. 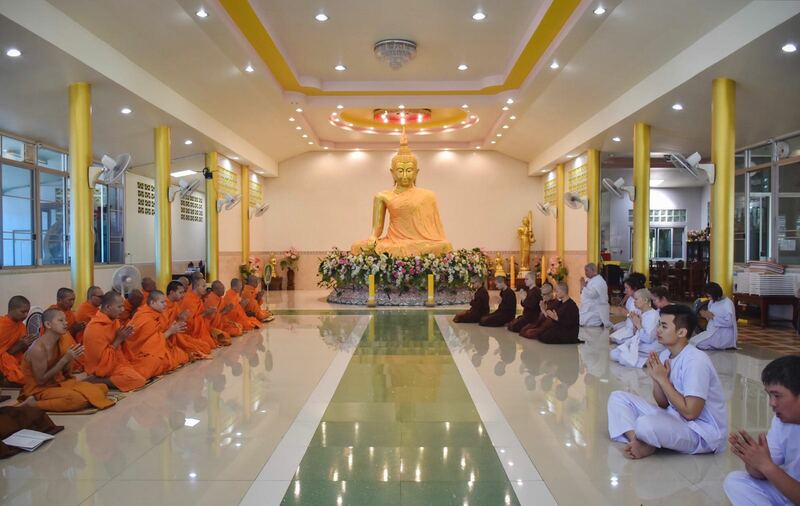 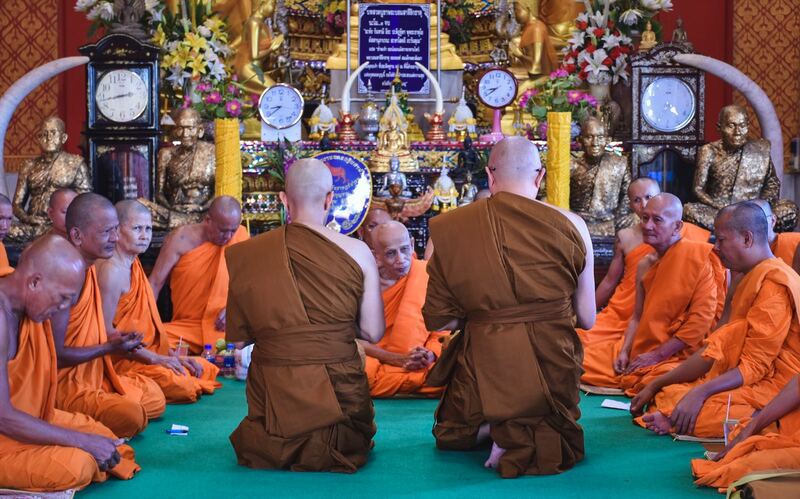 After which, the participants pay respect to the Preceptor and monks. 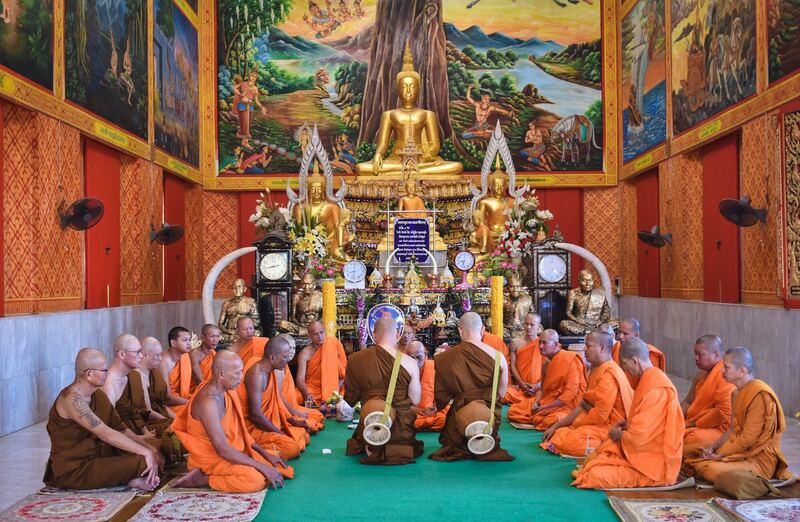 This is followed by chanting of the passages of going forth (to ordain). 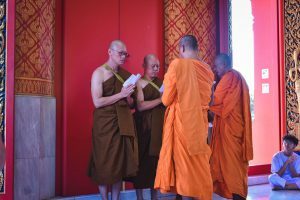 The Preceptor would then instruct the basic knowledge of the Triple Gem, explaining how he can go for refuge and how he can benefit by being ordained. 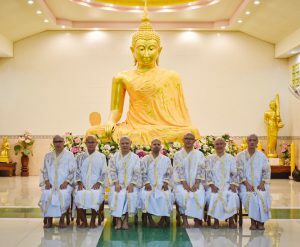 The Upacaya would tell the participant to commit to memory the 5 unattractive parts of the body (kesa, loma, nakha, danta, taco) and in reverse order. 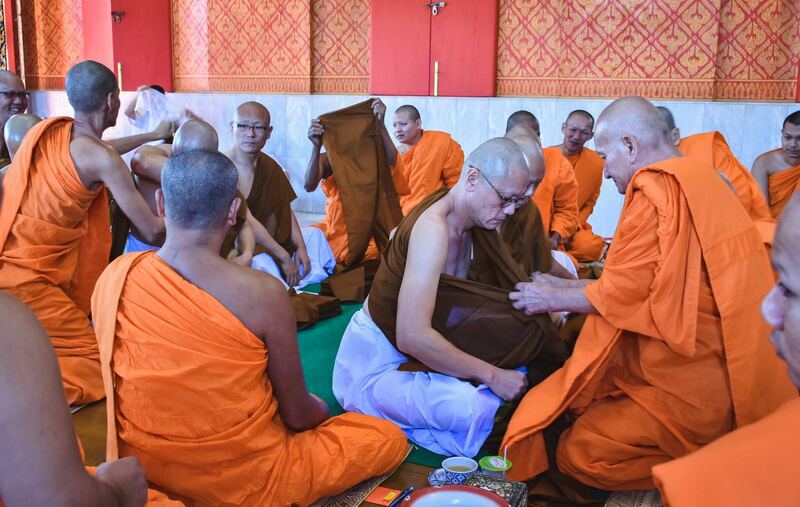 The participant would then remove his top shirt and Upacaya would help to put on the Amsa (shoulder cloth) for the participant. Each participants would then leave the assembly to change into the full monk robes. 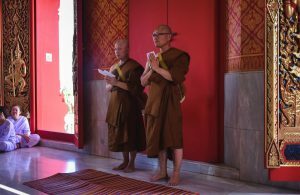 They are helped by senior monks. 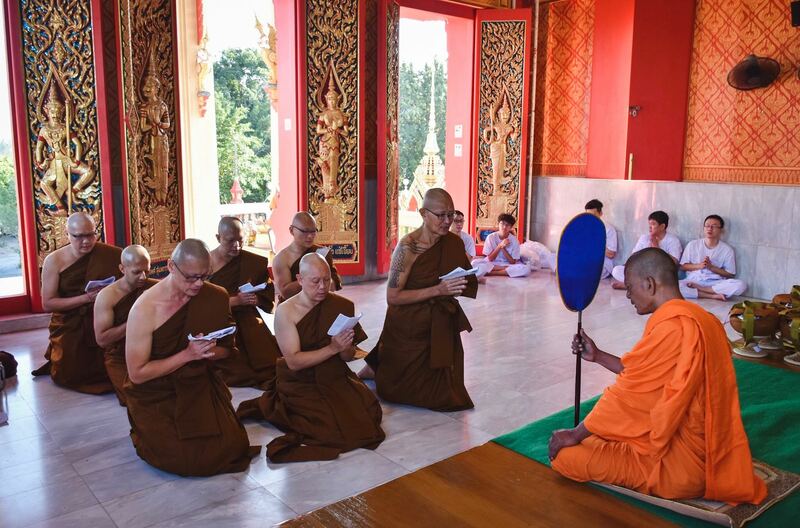 After the participants have changed to full monk robes, they would request for the Refuge and Precepts. 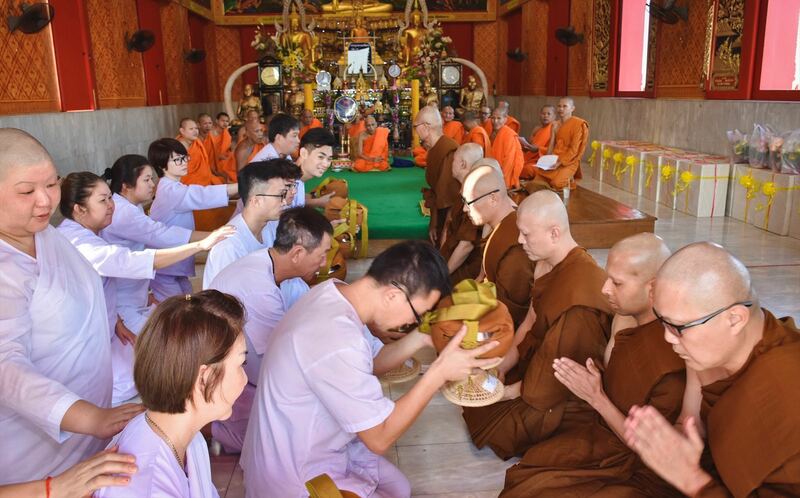 This is followed by offering of almsbowls to the participants by family members/representatives. 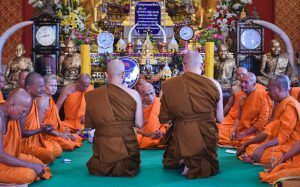 The participants would then be divided into group of two or three persons. Each process would be conducted separately, starting with the examination of almsbowl and robes. 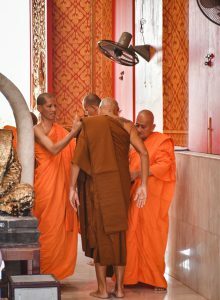 Following that, participants would leave towards the back of the hall, and stand facing the assembly of monks, taking special care not to step on the mat or cloth that are meant for the Acariyas. 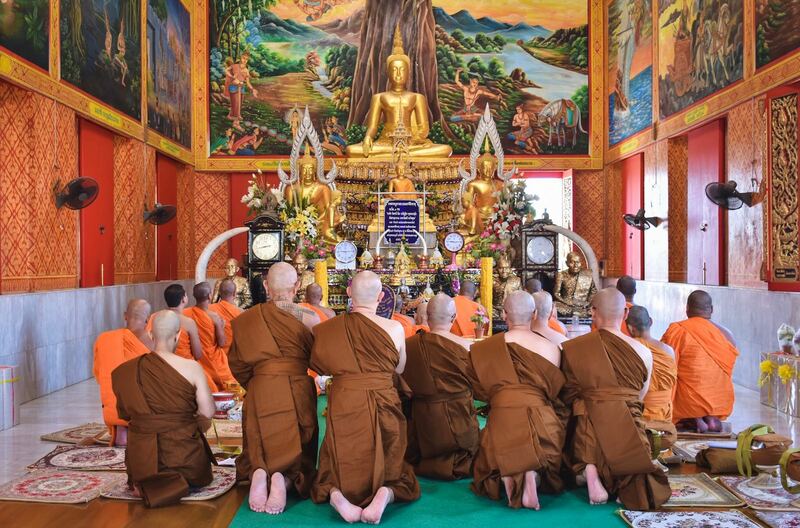 They would be subjected by ‘examination outside the Sangha’ one by one from 2 Acariyas (teachers). 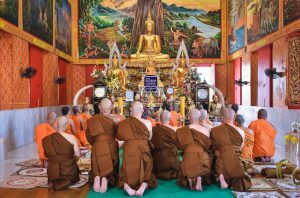 Upon completion, the Acariyas would then return to the assembly and report to the Preceptor. 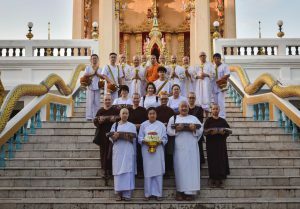 Once accepted, the participants would be gestured by the Acariyas to return to the assembly. 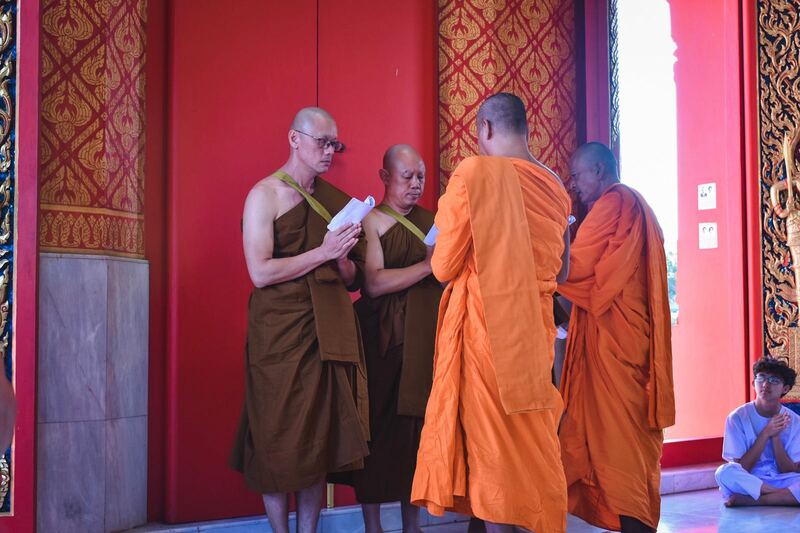 The participants are now accepted in the order. This process is repeated with other participants until complete. Khun Mae, the nuns and lay preceptors witnessing the ordination event. 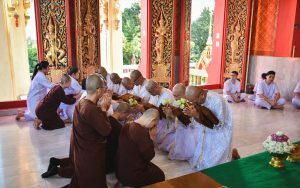 After the completion of the ordination, requisites are being offered to the Upacariya, Acariyas and monks who performed the ordination. 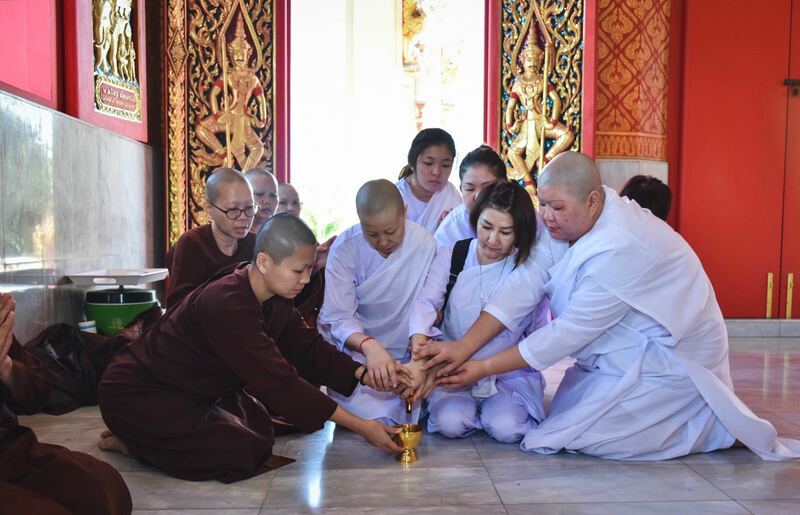 The transference of merits are being chanted and the symbolic pouring of water is done. Ordination as a monk yields enormous merits. 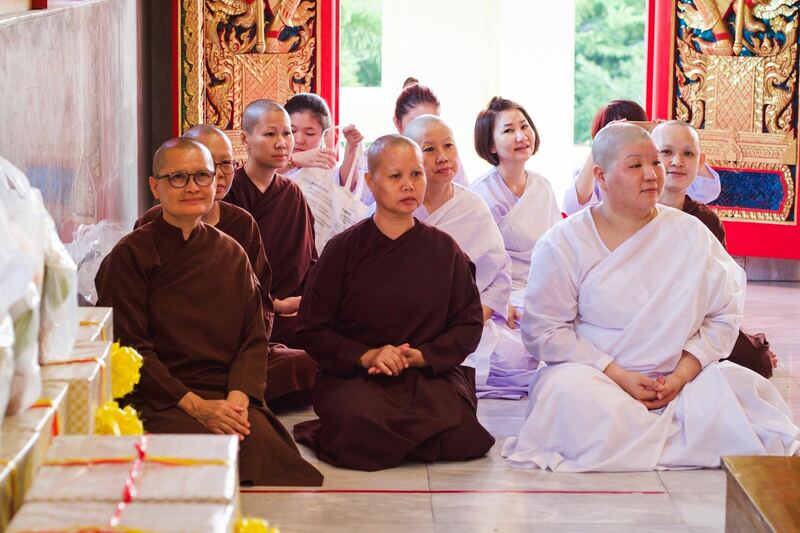 May the merits of the ordination be shared with devas, ancestors, family members, kammic creditors and other beings who are able to receive this merits. 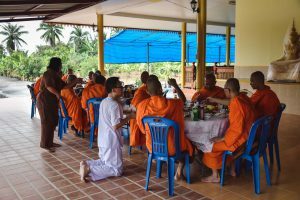 The ordination event is made possible through the generous time, effort and donations by supporters. 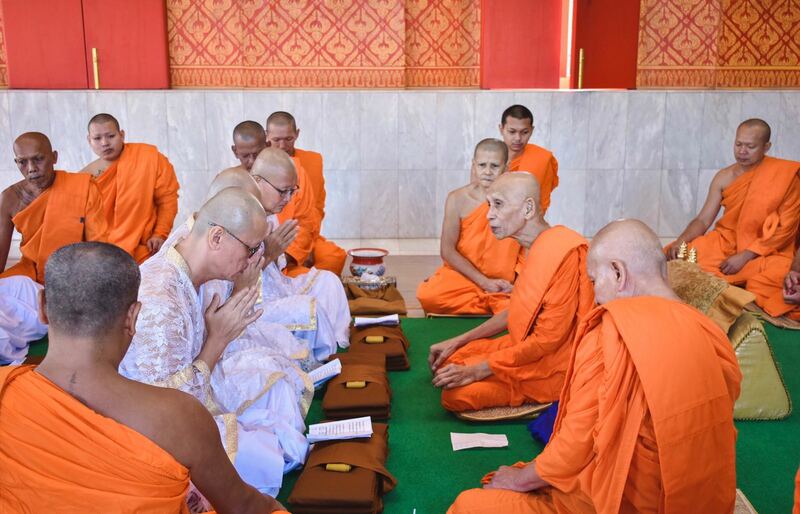 May all rejoice in the merits attained through this ordination event. 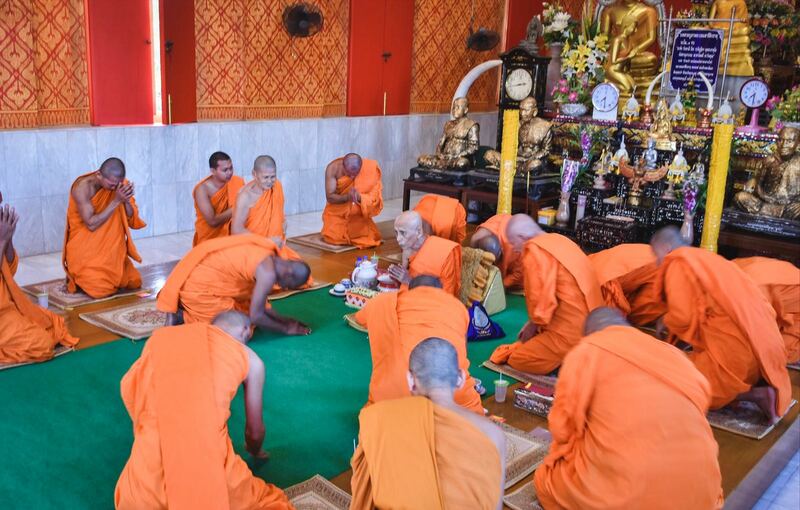 Monks from Wat Khlong Tan were invited to partake in lunch dana at Samathidhammaram Centre following the ordination. Lunch offering to the invited monks. 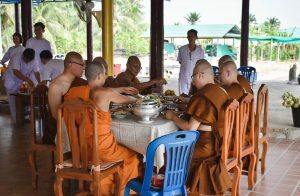 Above: The newly ordained monks having their first meal after completing the ordination ceremony. 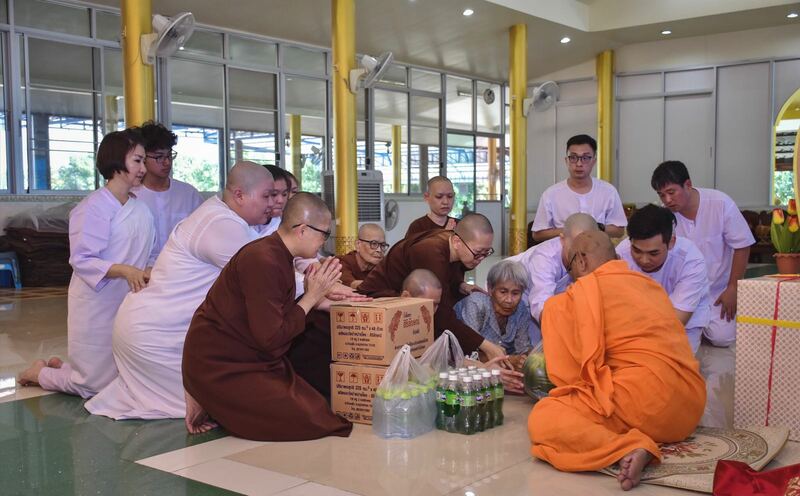 Requisites were also being offered to the invited monks.